← Will the revolution be tweeted? Take the degree, leave the mattress. 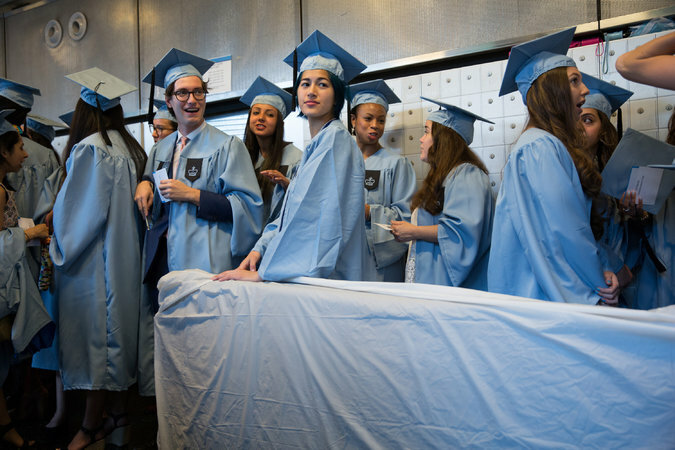 Emma Sulkowicz dragged her mattress across the Columbia University campus for the last time this week, when she participated in a Class Day graduation ceremony. This day, several friends helped Sulkowicz carry the mattress across the stages, but mostly she’s been hauling it on her own since September. She started the protest/performance piece/senior thesis after Columbia dismissed sexual assault charges that she’d filed against another student. (Two other students filed similar charges against the same man.) Sulkowicz vowed to carry the mattress until her attacker left Columbia. He did, marching across the stage to celebrate his graduation just moments before her. The Sulkowicz protest was a pain for Columbia, where she was periodically urged to drop the mattress. University officials warned her about bringing the mattress to the ceremony, and up until the moment she walked across the stage, pressed her to let it rest. The mattress protest was a reminder about sexual assault that extended far beyond the walls of Columbia University. By coming forward, Sulkowicz refused to accept the shame or secrecy more common in such events, and she also refused to accept the judgment of Columbia’s internal discipline procedure. (It has become very clear that universities are ill-equipped to handle what is essentially a criminal charge.) She also committed herself to reminding her classmates of not only the injustice she experienced, but also the much larger social problem of sexual assault. Sometimes, others joined her. At Class Day, allies taped a red X on their silly graduation caps. Before that, “No Red Tape,” the group they had organized, had held some larger events, including one where 28 mattresses were piled in front of President Bollinger’s residence. How does all this matter? Sulkowicz absolutely didn’t win on her most specific demand, ousting her attacker, but his senior year was probably less fun than he’d expected. Paul Nungesser, the accused, says their personal relationship was consensual, and claims that is he who is being harassed; he’s filed a federal discrimination suit against Columbia, its president, and the art professor who approved the senior thesis project. Pending. A protest like Emma Sulkowicz’s is often an invitation to dialogue, but after a few days surely everyone got the message. Anyone at Columbia would have had to work very hard to miss the point, or not to know the names of all involved. Even without conversation, it’s hard to think that the protest itself didn’t lead at least some young men and women to think a little bit more and a little bit differently about their social activities. We won’t ever get an accurate count on how many sexual assaults the mattress protest prevented. And Sulkowicz took her grievance with Columbia to a much broader audience. Senator Kirsten Gillibrand hosted her at the president’s State of the Union address in January, in support of her own efforts to force universities and colleges to deal more aggressively with sexual assault. President Lee Bollinger didn’t shake Emma Sulkowicz’s hand at the Class Day ceremony; it was nothing personal, a university spokesman later explained: the mattress got in the way. This entry was posted in Uncategorized and tagged art, Columbia University, courts, Emma Sulkowicz, Kirsten Gillibrand, Lee Bollinger, Paul Nungesser, performance, sexual assault, students, university, violence. Bookmark the permalink. 2 Responses to Take the degree, leave the mattress. This should be fought with every effort possible.Students needs to feel safe when learning.